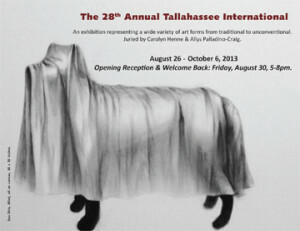 The 28th Annual Tallahassee International opens for viewing on Monday, August 26th. The Museum of Fine Arts (MoFA) is hosting a ‘Welcome Back’ reception and public opening on Friday, August 30th, 5-8pm. This year close to 200 artists entered the competition giving the jurors nearly 400 works to review. After much consideration, Carolyn Henne, Associate Dean of the College of Fine Arts and Art Department Chair and Allys Palladino-Craig, Director of MoFA, selected 43 works by 28 artists for the exhibition. A gallery of selected artworks is available for viewing. Selected works from the 28th Annual Tallahassee International will be on exhibit from August 26 to October 6, 2013. All museum exhibitions and events are FREE and open to the public! Winners of this year’s Tallahassee International exhibition were announced the week of August 26. “Our collaborative work comes to life at a thin line in space and time which marks the meeting point of our long time individual artitic practies. We seek to give a new dimension to both Dance and Film, to both Motion and Picture. We believe in movement’s ability to move, and in the expressive body as key to understanding, portraying and highlighting something of the human condition”. 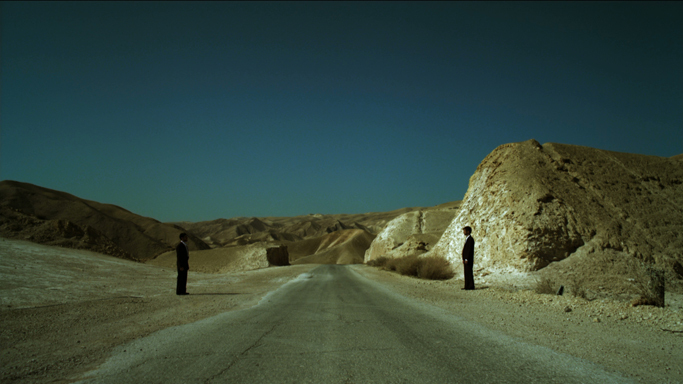 OREN SHKEDY and DANA RUTTENBERG, Private I’s, still from video, duration: 22 minutes. “My work explores the physicality of form and the ways in which objects occupy and conform to space, gravity and other objects. Softened and rounded forms created from elemental shapes allude to familiar forms and objects, but elude specificity. Bright colors are reminiscent of Pop Art forms that imply actions,create a silent dialogue between relational elements. Humor is always present in the way that these forms evoke a sense of the familiar and the absurd at the same time.These works “queer” the formalist art object and upend the viewer’s expectations of ‘aesthetic’ form”. For more information on the 28th Annual Tallahassee International and other events at MoFA, visit mofa.fsu.edu. For more information on the FSU Museum of Fine Arts (MoFA), including visitor information, address, parking, and other exhibitions, please visit http://mofa.fsu.edu.